Secrets to a Successful Business! The Everything Guide to Starting and Running a Restaurant is your key to becoming a professional restaurateur! Your dream can become a reality--just follow the steps Ronald Lee lays out for you in this lively, informative handbook. 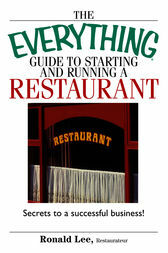 From financing your business and choosing the perfect location to attracting and keeping satisfied customers, The Everything Guide to Starting and Running a Restaurant is your starting point to an exciting--and rewarding--new career! This book includes: From cafe to gourmet--deciding what kind of restaurant you want to open; Your roadmap to success--creating a step-by-step business plan, with built-in goals; Design tips and tricks--set up your restaurant for maximum efficiency and aesthetic appeal; The right bite--guidelines for developing and designing a unique menu; Opening day--encouraging guidance for overcoming those initial hurdles; and more! The Everything Guide to Starting and Running a Restaurant will set you on the fast track towards a thrilling career doing what you love!